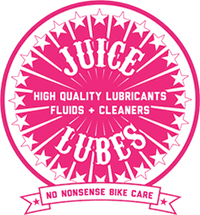 Juice Lubes was born in the UK - a brand that grew out of the need to alleviate stiction from grubby DH forks. In less than five years they have grown in to a global brand, with one of the broadest high performance lubricant ranges on the market, including cleaners and fluids - all designed and manufactured in the UK. Founder Will Miles says, "I don't think any other brand offers the same range of products that we do and we are the newest lube brand to the party - as far as I know." Juice Lube's aim? To keep you lubed up so you can ride as hard as you can while having fun.